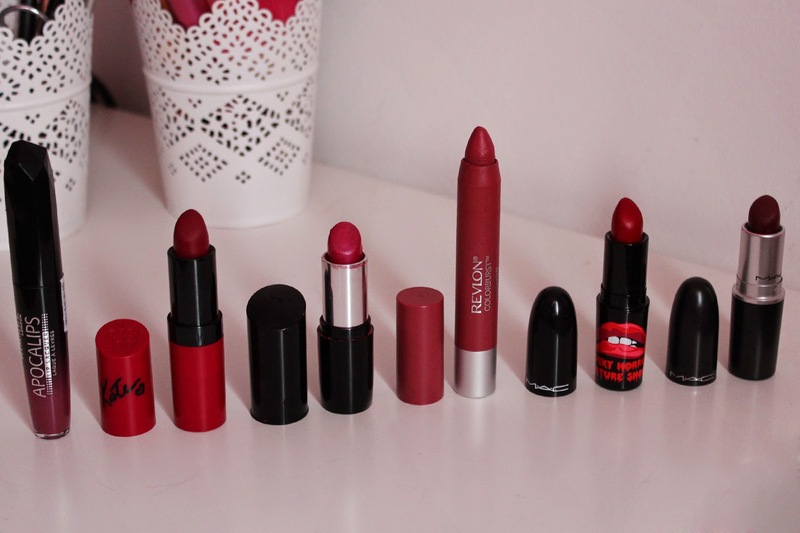 Today I want to share with you some of my favourite lipsticks for autumn and winter time! 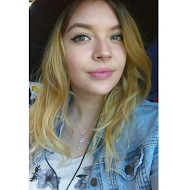 A year and a half ago I didn't really wear lipsticks much, but you could say I got converted! Now I'm known to love a pop of colour on my lips amongst my friends and honestly: nothing can beat a good lippy, eh? I chose a variety of different products from lipsticks to lip lacquers over to lip balms - so there should be something for everybody! I love everything about this! The colour is a gorgeous dark cherry, berry. The formular goes on liquid and dries on the lips but still leaves them looking glossy. The doe foot applicator makes it really easy to apply. Also the smell is delicious! Rimmel London Lasting Finish Matte by Kate Moss in "107": I think this is all bloggers, all time favourite lippy! 107 is a lovely wine red colour with a matte finish. It's easy to apply and has a good staying power. I also think it suits so many different types of people. Collection Lasting Colour Lipstick in "3 Sugar Plum": I gave this a mention in my first ever Favourites post last November (such a long time!) and I still love this. It's a lovely plum shade with a little bit of shimmer to it. You can either wear this sheen or build it up to a bright pop of colour. I've also had lots of compliments on the shade when wearing this! The balm formular is one of my favourites! It's so easy to apply, gives you a great amount of colour and it has a matte finish. The colour is a gorgeous plumy shade, with a brown undertone. This also has a lovely minty taste to it! This is a gorgeous blood-red shade with a slight blue undertones. Oblivion has an amplified creme finish. (You can read an in-depth review of this here!) Now unfortunately this lipstick is from the "Rocky Horror Picture Show Limited Edition" range, so I don't think you'll be able to purchase this anymore. But I still wanted to include it in this list as it's one of my faves! Also I'd love to know if you own something similar to this shade - I'd love to get a dupe of this! And last but not least a lipstick for all the brave ones out there! Diva is a super dark wine red shade with a matte finish. This lipstick is the definition of "vampy lipstick" for me! I really want to wear this more often this winter season and I hope I'll be brave enough as this is such a gorgeous colour! I've got a full review of this over here if you're interested! 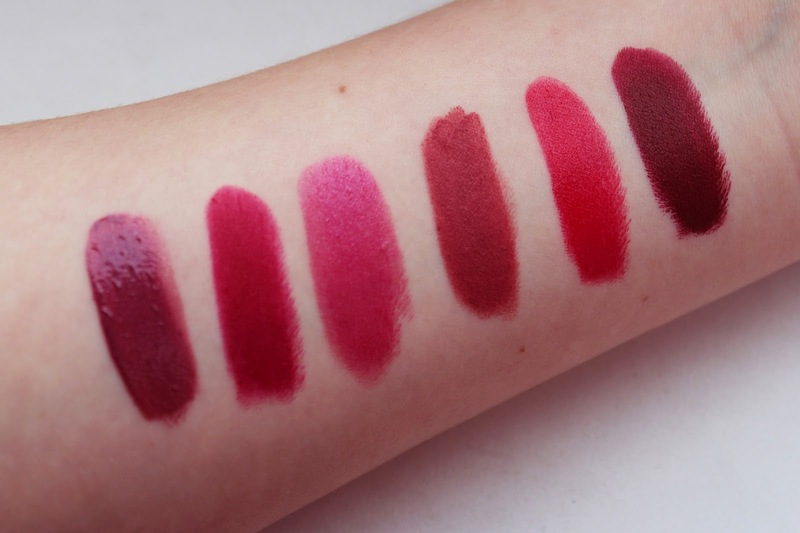 What is your favourite lipstick for Autumn / Winter? Do you own any of the one's I've mentioned? And are you excited for the festive season? ALSO: Have you already entered my 1 Year Blogiversary Giveaway to win a MAC lipstick of your choice?